This is an Icelandic name. The last name is a patronymic or matronymic, not a family name; this person is properly referred to by the given name "Kristján Eldjárn". 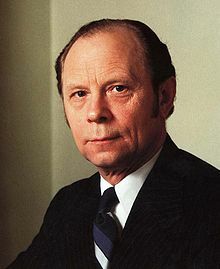 Kristján Eldjárn (December 6, 1916 – September 14, 1982) was the 3rd president of Iceland. He was president from 1968 to 1980. He won as the underdog in the 1968 presidential election, winning 65.6% of the vote on a 92.2% voter turnout running against Gunnar Thoroddsen. His son is Þórarinn Eldjárn who is a popular author in Iceland and his daughter Sigrún Eldjárn is also an author. This page was last changed on 19 December 2017, at 13:28.